What boys (especially) do to pencils. As a teacher I use pencils a lot – mechanicals as well as wood cased. For many years I’ve just used the generic no-name pencils provided by the school and occasionally a ballpen, without thinking much about that it could be different. Then first “Pencil Revolution” and a little later “Dave’s Mechanical Pencils” came into my life. It all started with a Gessner pencil and since then I have developed into some kind of pencil nut – thank you very much Dave! Another addiction, just what I needed. Anyway, I got this idea that many of the good looking and much hyped pencils would be a blessing for my pupils in place of the usual generic “no name” scratchy HB’s (why does the school issue these? I thought). Also, I was curious about how luxury pencils would perform in “real life”, in my case in the hands of boys in a classroom. I have found this to be “the ultimate pencil test”. I’ve seen what pencils are used for besides writing – so if a pencil can survive this, it must be OK. The test is: Give one of the expensive and much praised pencils to a schoolboy for a week or two and see what’s left of it afterwards. I didn’t expect any of them to survive for long. In my head was the picture of the Charge of the Light Brigade…. I have carried out these experiments for some time now and would like to share the results. The Pencils were both wooden and mechanical and I chose from the ones I had already tried myself and found to be good. The pencils were exposed to the general pupil activities: throwing, stabbing others, “pencil fight”, spinning, “peeling off”, “over sharpening”, biting, chewing, tearing apart, rolling around in “unfriendly quarters” – besides sketching and writing of course. Normal school activities for those in grade 3. The eraser was the first victim – most erasers were off in one or two hours at the most. They were peeled off and used for ammo, or the more peace loving boys (and girls) tweaked them out while erasing. So built in erasers don’t work at all. The soft pencils were very popular – as they provided the really jet black line and had to be sharpened often – a great excuse for a longer pause. Due to the much sharpening, they didn’t last a week. Only some of the pencils survived the first week, most were sharpened to death and then tossed. The least durable. The Helix – a nice soft HB, but the lead broke quite often as did the Mongol and the Uni Mono pencil - very disappointing. Probably due to the fiendish conditions – a lot of “pencil fighting” and of course they are frequently dropped on the floor. The most durable. The Grip 2001 - in fact the most durable concept. The eraser/point protector worked better than a built in eraser. Not that they weren’t lost or used for other things, but surprisingly the concept of a point protector was welcome – and most of these survived. 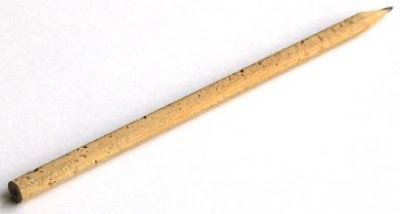 Besides, the pencil was durable – the lead didn’t break, and didn’t have to be sharpened that often. The Staedtler was a little shorter lived as it was softer. But these two survived longer than the rest. The Atlas novelty pencils had vanished from the face of the earth. Their value seemed to lie in fields other than writing. I think some of them live a secret life in the school’s underground economy as trading objects. At the end of week one none of the pencils looked good and at the end of week two only bits were left of most pencils and their numbers heavily reduced. From the the original dozen Mongols issued, only two were left. Of the Helix only one, Of the Mono Uni pencils three and a half. 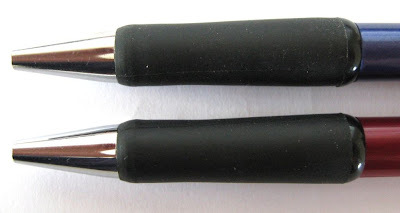 The Grip 2001 were fewer from the start – only 4 issued and of those only 1 ½ were left. The Staedtlers were issued in a similar number, only one left. Much the same pattern. 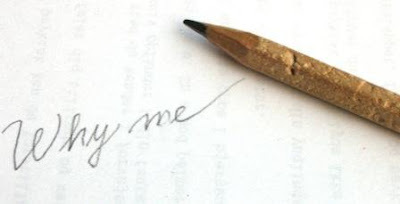 Only exception was the absence of a long sharpening break, which made mechanical pencils less popular in general. Any soft parts would be peeled off almost from the first day. The erasers were great fun – especially the extendable ones. A lot of them were chopped up to provide plentiful ammunition – or as with the wood cased pencils, “erased off”. Of course, the pencils had to be taken apart and re-assembled which made up for the sharpening break. You can’t write anything with a pencil which has “suddenly come apart” and you can spend quite some time trying to assemble the thing again. No caps or clips survived for long – they went missing or were broken off from the first day. However, most of the mechanical pencils tested were still able to write at the end of week one. 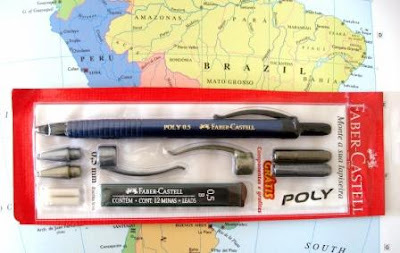 No mechanical pencil survived the first day fully functional, eraser and all – the more soft parts (rubber grips and erasers) the worse. The more gadgets the worse. 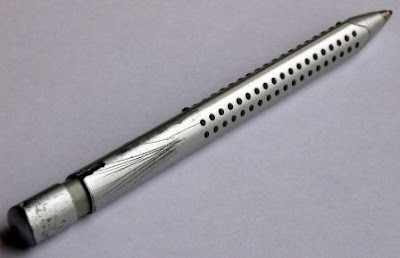 A mechanical pencil with no cap, eraser, clip or rubberized parts would stand the best chance, which is quite contrary to the way most “school pencils” are built. I would guess, that a Yard O Led would have survived, but that would be an expensive solution. Mechanical pencils live a bit longer than wood cased – if you don’t mind the missing clip and eraser, and the torn rubber grip. A Grip 2011 after one week. A Triplus Micro after two weeks. 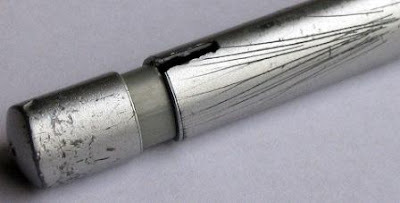 In spite of the rubber grip – the Pentel Twist Erase was the most durable – for some reason it survived almost intact - though attempts was made to kill it off by chewing it to death. Oh, and the “F-C clone”? It didn’t live a day. This experiment was carried out when my pupils were in grade 3 – a year when handwriting is focused on. The pupils are children with some special education needs and therefore not representative of common Danish students. However, I thought their approach to writing etc. would really put the pencils to the test. The lesson to be learned, IMHO, is that no matter how much I would like to give my students good pencils, it would seem that there is a good reason for the generic “no name” pencil in school. And that a new and different pencil will always be chewed on just to break it in. All this took place in 2007 and was meant as a bit of fun for all of us. I don’t think the same disasters would happen again as my students are now older and wiser. So am I. 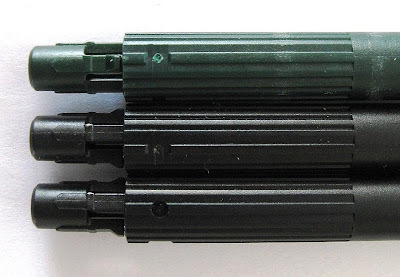 There are several sub-variants of the Zebra Tect 2way with cosmetic differences from each other. Mine is a “Tect 2way light” which appears to mean it has a transparent plastic body and grip section. Other variants have solid colours, and others have metalized grip sections. Pricing varies significantly amongst these options. 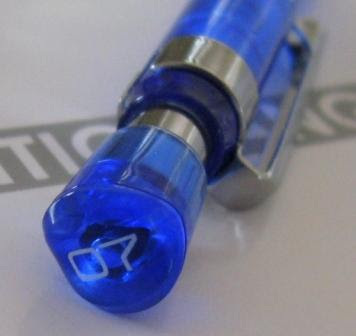 Some readers may recall an earlier rant about a particularly blue pencil. Well, my Zebra Tect2way is blue, and it looks pretty good. Not good enough for another rant, but it’s getting close. So then, nice blue transparent body, some nice crisp lettering in white, shiny chrome trims…overall a good looking package. The grip section has three rubber rings around its lower part and a couple of concentric depressions above that. The rubber rings are a little bit too low down towards the tip for me, I would prefer a fourth one. They stand reasonably proud off the surface and so do give you some extra grip. Their feel under finger is a little unusual and may not be to everyone’s taste. 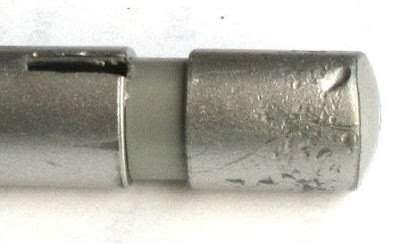 The lead sleeve is a 4 mm pipe suitable for drafting, but not so suitable for your pocket. The pocket clip is a simple piece of bent steel, rather strong so it won’t be sliding off whatever you have clipped it to. Up at the top of the pencil the push top button freely rotates and spins around which is a little unusual. It has the lead size “07” (no decimal point) printed on the top of it, in a font that I like. 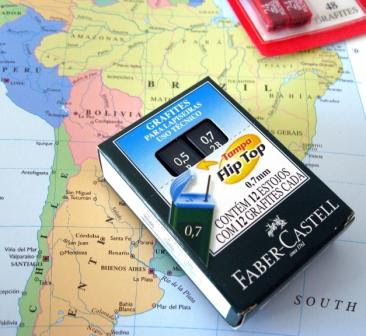 You pull the top button off to reveal a small eraser and that comes out to access the lead chamber. You can use the top button as an ordinary push top ratchet mechanism – 10 clicks will get you about 7mm of lead. However the lead advance mechanism is a shaker system, so alternatively you can of course just shake the pencil to advance the lead. The shaker strength seems about right to me. It doesn’t seem to activate inadvertently, but you don’t have to risk whiplash of the wrist to get it to operate. The internal shaker system weight is spring cushioned at the top end of its travel which produces a rather interesting bouncy effect when you are shaking. The main feature of this pencil, the feature that the sales advertising seems to focus in on as a point of difference from other mechanical pencils, is that the shaker system can be turned on or off. At the top of the grip section just above the chrome band is a short rotatable ring section. You turn the ring section one way and the shaker system is active. You turn it the other way and the shaker weight is held fixed in place so it won’t activate the lead advance mechanism. I guess this one/off feature is the origin of the 2way bit in the name of the pencil. I suppose you could also use the ‘off’ feature to lock the shaker weight in a specific place and thus customise the balance point of the pencil. But then of course you would not be able to use the shaker to advance the lead. Whether the ability to turn the shaker system on or off is of any value to you is obviously an entirely personal thing. It seems to me that in general people either like shakers or they don’t, thus the ability to convert the pencil from one to the other is somewhat gimmicky. I’m sure the feature has marketing value as something unusual and a differentiator from the competition, but whether it has any practical value…well that’s an entirely different matter. Just for the record, for me personally it has little value. At the end of the day I quite like this pencil, but I’m not sure I would make much use of the shaker on/off facility. I’d probably just leave it on as I quickly developed a habit of flicking the pencil around to make the shaker weight bounce on its sprung top end-stop. Best Points – The spring bounce of the shaker. Not So Good Points – Not much really. Not pocket safe, and could do with an extra grip ring or two. Does this pencil make it into the Top 5? – It’s a good pencil, but No. Dimensions – Length 150mm, diameter 11mm at widest part of grip. Balance point about 70mm up from the tip, with the shaker weight at the front (tip end) of its travel. 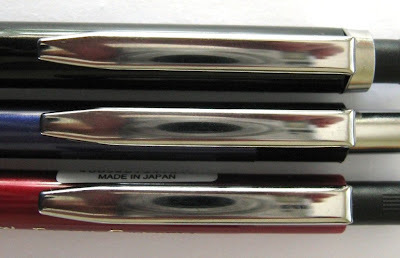 Back in November 2007 in my posting The Mysterious Kotobuki I mentioned the similarity between the Staedtler Elite 9705 and Faber-Castell Grip 1335 mechanical pencils. 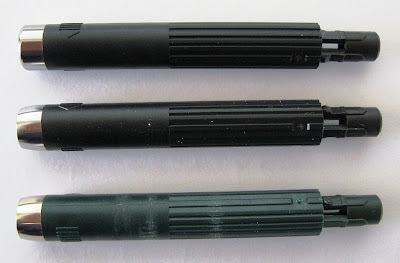 In August 2008 the Attack of the Clones posting pointed out the variant and copy relationship of three mechanical pencils. 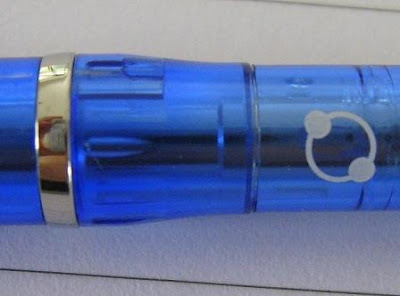 Just recently I reviewed the Staedtler Integrity 9505 and I noticed the twist out eraser cartridge looked very familiar, which started some cogs ticking over in my mind. So, now it is time to take that whole line of clone-thoughts a little further. Let’s take four pencils. 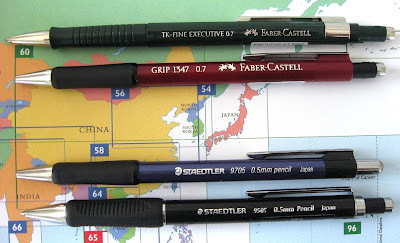 The Faber-Castell TK-Fine Executive, Faber-Castell Grip 1347, Staedtler Elite 9705 and Staedtler Integrity 9505, as pictured below. At first glance they seem to be four fairly normal pencils, but let’s delve a little deeper. Right, what have these four pencils got in common? 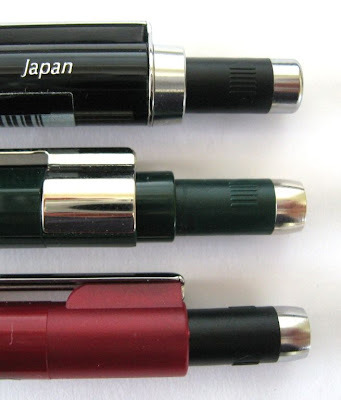 Well, despite being German brands, all of these mechanical pencils are made in Japan. 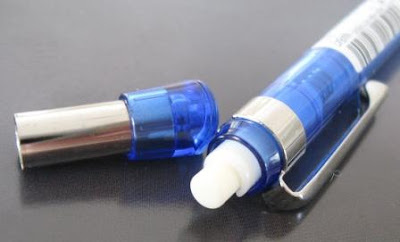 I mentioned above that the twist our eraser cartridge of the Staedtler Integrity looked familiar and got me thinking. Well, three of our four pencils have a twist out eraser – Staedtler Integrity, FC TK-Fine Executive and FC Grip, as shown below. If we extend the eraser cores out to their fullest extent we can see that they are the same diameter and length, and that they all have little red plastic fingers to hold the eraser core to the cartridge. 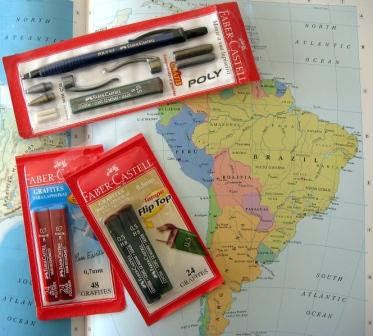 Nothing surprising about the two Faber-Castell cartridges being the same, but the Staedtler one too? 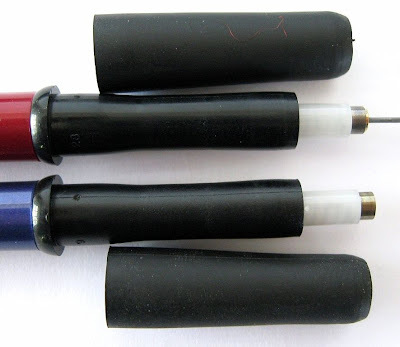 Here’s the three eraser cartridges pulled out from their pencils. Apart from the differing metal cap bands they are remarkably similar. “Remarkably similar?”. Get out your micrometer, look at the design, the mould markings, the little twist instruction arrows moulded into them. Remember the red plastic fingers? These cartridges are not similar, they are the same. Play a game of mix and match. All three of them fit into and work perfectly well in any of the three pencils. 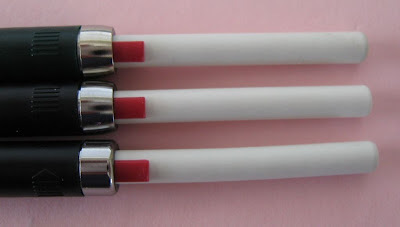 So, I would strongly suggest that these three twist out eraser cartridges are made by the same manufacturer, and they have just put some different metal cap bands on them to give some difference in appearance. Classic variants of a base model. How about the pocket clips? 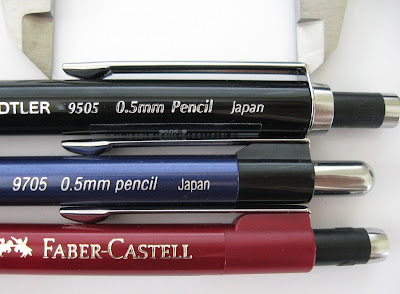 Three of them look rather similar – the Staedtler Integrity 9505, Staedtler Elite 9705 and Faber-Castell Grip 1347. Side on, note how the tip section is folded under exactly the same. The only difference is the mounting method of the Integrity 9505. 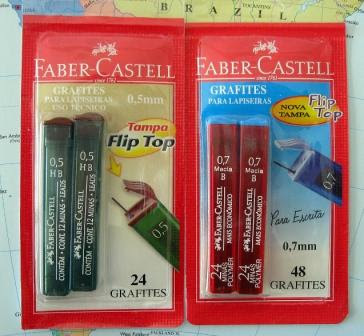 The Staedtler Elite 9705 and Faber-Castell Grip 1347 pocket clips are identical. Face on, they are impossible to tell apart. So, I say the Staedtler Elite 9705 and the Faber-Castell Grip 1347 pocket clips are the same clip and the Staedtler Integrity 9505 clip is a variant from the same manufacturer. Let’s now move onto the sharp ends of the Faber-Castell Grip and Staedtler Elite. Here they are below. Just ignore the eraser cartridge for a moment. Don’t they look similar? 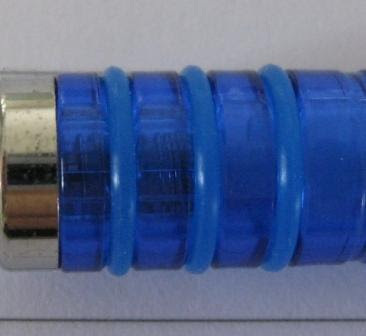 Here’s an enlarged view focusing on the rubber grip and metal tip section.. So similar I cannot detect any differences. Now unscrew the metal tips. Still looking exactly the same. Pull the rubber grips off. Still looking exactly the same. Note how both have the same positioning flange at the base of the shaft for the rubber grip to seat back up against. Brazil….steamy jungles, boa constrictors, capybaras, jaguars, Rio! Fantástico! I'm back and kicking-off 2009 with something a little exotic. Well, exotic for me, anyway. 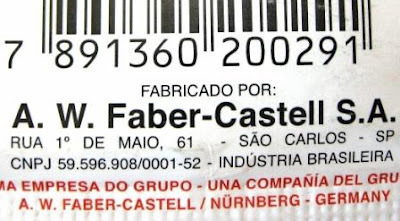 Way up the Amazon, in the city of Manaus, is an outpost of Germany - a Faber-Castell mega-factory to be specific. Whilst not really a centre of mechanical pencil production, they do make a couple of MP items, namely leads and some economy pencils. My thanks to Adriano of Cool Pencils of Brazil for sending me some of these Germans from Brazil. 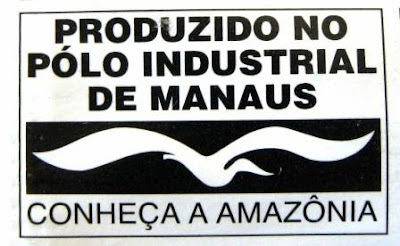 He tells me that Manaus, in the Amazonas state, is a traditional manufacturing area where the taxes were very low to encourage manufacturing companies to set up their plants and thus help “develop” the region. Apparently there are a lot of electronics factories, motorcycle plants (Honda) and so on producing for the Brazilian and wider (South) American export market. In the words of Adriano, “…besides Samba, Cachaça and Futebol, we make some lead”. Well the ol’ Futebol isn’t that big down here in Rugby-land, but we know the Samba-Kings are the team to beat when it comes to that funny game with the round ball where you can’t use your hands. Some of us also remember that singular moment of glory when our team actually made it to the 1982 FIFA World Cup, and Oh!, how happy we were on 23 June 1982 when we pulled one out of the hat and managed to just plain old lose, rather than be annihilated by Brazil. 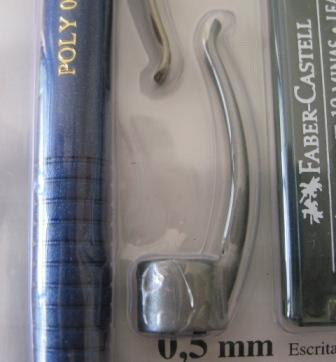 So firstly, the Faber-Castell “Poly” mechanical pencil, sold in a vacuum shrink-wrap sort of hang-sell package. Its obviously an economy or low price range pencil, but the interesting thing about it is that it comes with a selection of interchangeable components. It is assembled with black components, but the package contains silver and bronze replacement tips, pocket clips and eraser covers so that you can mix and match and make up your own colour scheme. Two replacement erasers and a container of B leads is also included. 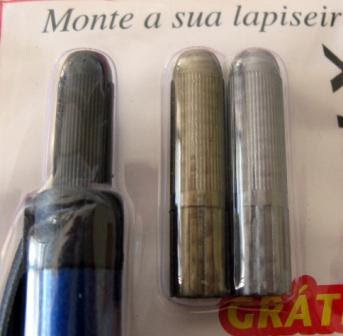 Adriano says he has also rung the 0800 number and confirmed this pencil and the leads are really manufactured in Manaus, not just assembled or re-packed there. The selection of leads consists of two hang-sell packs, and some loose containers.. For the hang-sell packs, one contains 2 tubes if 12 x 0.5mm HB leads, and the other contains 2 tubes of 24 x 0.7mm B leads. So, you get twice as many 0.7mm as 0.5mm leads. 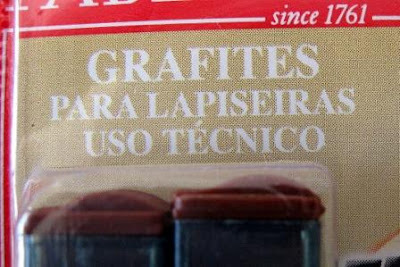 Also, whilst both are “grafites para lapiseriras” (leads for mechanical pencils), the 0.5mm are also “uso tecnico”. 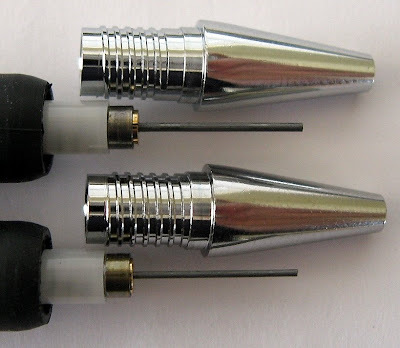 Both 0.5mm and 0.7mm leads are available in HB, B and 2B grades. The “Tampa Flip Top” of the lead containers is also obviously a feature. 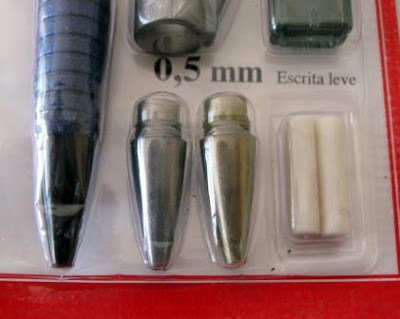 The box of 12 containers also notes the existence of 0.9mm leads in HB, B and 2B. Whilst the 0.7mm leads in the hang sell pack are 24 leads in a red container, loose containers are 12 x 0.7mm leads in a green container just like the hang-sell 0.5mm leads. 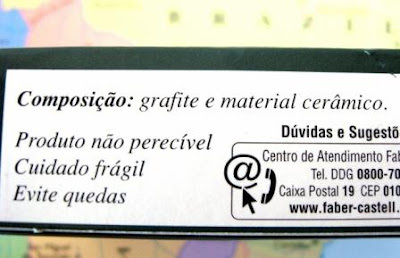 One thing that does confuse me though is the word "cerâmica" on the lead refill box. Surely I should be reading "polímero" rather than "cerâmica"?